I need a white lab coat!! he's not reclining at all!?! it's pretty much how I imagined his studio to be. 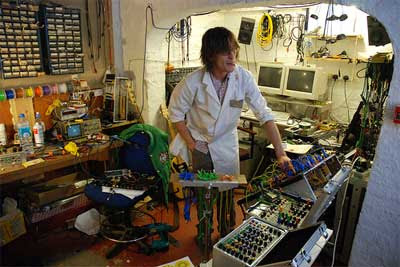 messy and filled with crazy electronic goodness. Tom Is a great fella. He was kind enough to burn a few PCB boards featuring the infamous Texas Instruments Sn synth chips for me,(for a nominal fee) as busy as he was! Hope to "hop the pond",drink a few pints and jam out with the bugster down in Bristol someday! What's up with this dazed and confused? Wiley Wiggins involved (e.g. Weevil). Ha! Tom Bugs rules, I have a brown weevil that rocks! His DIY pages share some of his designs so you can build some exotic noisemakers yourself.